This diagram represents The Patterns of Postural Change, Sara Meeks' concept of what happens to the human body as, but not because, we age. This is not necessarily the only pattern that may occur, but it is the most common one I have seen in my practice. 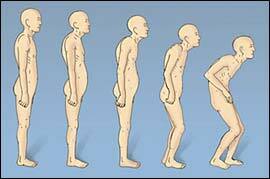 The Meeks Method is a program designed to prevent, arrest and/or reverse this highly avoidable postural aging process. You will note that I stated above that the Patterns of Postural Change occur AS, but not BECAUSE, we age. If they do not occur because of age, then why DO they occur? Let's take a closer look at the picture. If you were to envision a person who is 25 years old, would you think of the figure on the left or right of the continuum? If you were to envision a person who is 85 years old, would you think of the figure on the left or right? Do we not associate age with a forward-flexed, stooped-over type of posturing? However, I say it is AS we age because, in my practice, I have seen people in their 80's and 90's who resemble the person on the left side of the continuum and people in their 20's and 30's who more closely resemble the figures on the right side of the continuum. I have also seen people in much more advanced postural changes than the figure on the right. This pattern is a result of many occurrences in life. Assuming that a person is born without any anatomical abnormalities, posture at any time during life will be representative of how life has been led, some of which is under a person's control and some of which is not (e.g. life as an infant and young toddler would be largely determined by parents and other influential people in a person's life. )* It will be representative of how much and what type of exercise/movement/activity, how much sitting and standing has been done along the way. It will also be representative of emotional states and belief systems, what kind and how many accidents, illnesses, and/or surgeries have been encountered along the way. At any point in life, a person is the sum total of what was present at birth and what has happened throughout the life span. As you look at this picture, determine where you fit along the continuum. Then, imagine where you will fit in 5, 10 or more years. If you do not like what you see, then consider taking steps to avoid problems in the future. If you do like what you see, vow to preserve your good body alignment for your lifetime. Good body alignment in older age does not necessarily happen by accident—you may have to work at it. The Meeks Method is designed to help you do this personally and also to help you instruct your patients to age more functionally and gracefully. Information in the Level I, Yoga or Pilates Seminars explains the Patterns of Postural Change in much more detail. *Of particular concern in this process is the increasing use of car seats as baby carriers/cribs/high chairs and so on. What was designed as a safety device for babies traveling in cars is now a portable, multi-functional “container” in which infants spend hours a day, passively watching the world go by as they are strapped in and unable to move. 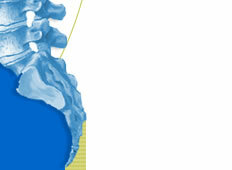 Humans are created to move and it is through movement that they develop healthy bones and bodies. We know that babies move in utero and that they should continue to move and develop the strength and flexibility to roll over, crawl, sit up, and walk. However, newborns now leave the hospital in the car seat and, from that point, may be immobile for hours during the day. The American Academy of Pediatrics is now recommending that car seats be used in the cars and that babies be taken out of them when they leave the car. Prone (on the abdomen) To Play.......Supine (on the back) To Sleep is also recommended. I am extremely concerned about the increased passivity, positioning and lack of movement of our babies. I believe most of this is induced by our society's pre-occupation and adjustment of our lifestyle due to fear (of injury and germs) and also by our increasingly busy lifestyle. In any case, I feel great empathy for busy parents who love their children and want to do the right thing for them; I also feel great concern for the babies who are bearing the brunt of what is going on. We may be raising a generation of weak, fearful, passive children. As I observe out in public what is happening, I see babies observing, but not participating in, life, staring out from their "containers" with vacant, non-involved eyes. It's almost as if they dare not show interest or excitement when someone approaches them because they know they won't be picked up, cuddled and/or played with and/or have human contact. I see “Baby Boot Camp” advertised on the internet. This is an exercise class where the babies stay in their strollers or car seats which are arranged in a circle and watch their moms exercise in the middle of the circle. I would suggest Baby Boot Camp be arranged with the babies playing and moving in the middle and the moms standing around watching. What is happening with these babies has physical, mental and emotional consequences and, because the human body is programmed to develop in certain sequences and timelines, there may be no “catching up” later in life. I would welcome any comments on this issue and am looking for networking opportunities with therapists to help get the word out about the issues surrounding the increasing “sedentary lifestyle” of our babies. Contact me via my email address if you are interested in getting involved.